The best years McDowell Remodeling has had, in terms of window replacements, have followed extremely cold, blustery winters. That tells Sue McDowell, co-owner of the St. Charles-based remodeling specialist, that many homeowners don’t prep their homes for winter. Instead, they fix problems they find after the fact – and after they’ve lived in a chilly, inefficient home all winter long. You don’t have to wait for those cold drafts to seep through your walls before learning whether your home needs an efficiency tune-up. Early in the season, you still have a couple of months of “good” weather until winter arrives, so it’s an ideal time to prepare your house for the months ahead, McDowell says. Fall is a hectic time of year for the trades – remodelers, plumbers, painters, electricians, chimney sweeps, included – because this is the time when homeowners realize they need to tackle those urgent issues, McDowell says. Keep this in mind, she says: it normally takes four to six weeks to order new doors and/or windows. If you wait until November to place your order, you might expect a January installation. Even if it’s late in the season, you don’t have to wait until spring to fix the problem. “We can change your windows in January or February, and if they’re really bad, it’s better to do it sooner than later … but it’s best to get it done before it gets cold, so you don’t have to worry about it,” McDowell says. The best advice is to remain proactive. Before the cold weather arrives, it’s a good idea to conduct an energy audit of your house to learn what’s efficient – and what’s not – says Kristi Falco, an exterior sales representative/designer at McDowell Remodeling. Some companies will use infrared equipment to show homeowners exactly where air is getting into their home and where they might want to beef up their insulation, says McDowell. You can also do a home inspection yourself, says Falco. Just remember, any small leaks or minor holes, if left unattended, could lead to larger repairs, so don’t ignore the issues you do find. Start with your exterior siding. Any imperfections in the material – particularly cedar or old T1-11 (an untreated wood siding panel) – can allow air or water into your home, Falco says. Sometimes DIY waterproof caulking can keep Mother Nature at bay, but if you suspect the problem runs deeper, now is the time to have it examined professionally. Falco and McDowell recommend protecting homes with fiber cement or vinyl siding, particularly insulated vinyl, which not only provides a temperature barrier, but also provides strength to each panel, McDowell says. Its cost is also similar to traditional, uninsulated vinyl siding. Product may cost 10 to 15 percent more, but installation is the same, McDowell says. After you’ve inspected your siding, take a look at your roof. Make sure there are no loose or raised shingles or any nails popping up. If you notice anything out of the ordinary, consider contacting a professional roofer to take a look, McDowell says. With the possibility of heavy snow loads sitting on your roof all winter, it’s better not to take any chances. While you’re up on the roof, don’t ignore your gutters. Often, homeowners will forget to check for leaves and branches that can get stuck, and without removal, snow and ice can’t melt and drain properly, Falco says. If water can’t drain, it will go elsewhere. Keep in mind that trees and bushes shouldn’t be touching your roof or home, Falco notes. Next, check your windows, doors and even outdoor faucets – any place that has possible venting into the home – and make sure everything is sealed tight, Falco says. Spray foam and/or caulk may be simple fixes to prevent drafts, but this is another area of efficiency you don’t want to leave unchecked. If you’ve been hemming and hawing over whether to install a storm door, just do it, McDowell says, particularly if you have an older home and don’t want to change its historical integrity. “If you aren’t ready to change your windows or doors, storm windows or a storm door are options to keep out cold air,” she says. It’s also a good idea to have your chimney flue cleaned before winter arrives. Not only can this improve the efficiency of the fireplace – and ensure everything is venting and working correctly – but it’s a safety precaution, as well. Birds’ nests and other material that is highly flammable should be removed before you warm yourself by the fire. Finally, have your furnace inspected. “Just as you get a physical every year, so should your furnace,” Falco says. While efficiency is important to a home, cleanliness and curb appeal also matter, especially when you realize that growths like algae, moss and lichen can decrease the efficiency of your home. House Shampoo, a roof and exterior cleaning contractor based in McHenry County, works almost year-round cleaning and restoring roofs, siding, decks, brick and stone, fences, outdoor furniture and even statuary. You’ll know an asphalt roof is covered in algae and lichen by its telltale signs: black streaks and the appearance of a dark, veil-like covering that most homeowners mistake for dirt. When you see these signs, you know those living algae colonies have developed a root system anchored into the roofing material. Instead of using high-pressure power washers to clean away the algae colonies, House Shampoo has created specialized cleaning solutions that are applied topically with no more pressure than that of a garden hose. That’s especially important for cedar roofing affected by heavy moss infestation, Zylinski says. “To agitate, brush or power wash that growth off the shingles is tantamount to ripping out a weed from a flower bed – sometimes the flowers are coming with it,” Zylinski says. House Shampoo’s low-pressure solution works wonders on a cedar roof, but it needs time and exposure to the elements to dry out the moss so it can release naturally and avoid damaging the shingles. Cool autumn days can provide just the right amount of wind and sunshine to help the process before the snow hits, Zylinski says. Many people prepare to list their homes for sale in late February, but roofs and siding can’t be cleaned with snow piled on the house. And since there isn’t any landscaping or vegetation in late winter or early spring, the primary focal points for potential buyers are the exterior structural features and their condition. 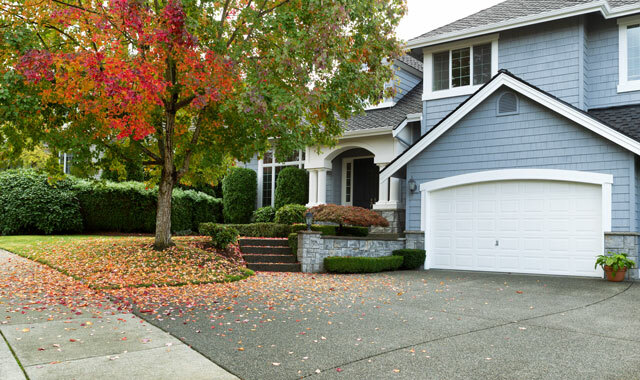 “Whether you’re selling or not, your home is the focal point of your property and your most expensive investment, so taking action in the fall to get it in pristine condition is just smart,” Zylinski says. While you’re preparing your home for winter, don’t forget about your garden. Halloween or the first frosts/freezes – whichever comes first – is a good time to start cleaning up outside. But you don’t have to do much at all if you don’t want to, says Sean Ducey, manager at Whispering Hills Garden and Landscaping Center, in Crystal Lake. Many plants don’t really need to be touched in the fall. If you’re dead set on getting some gardening work done before spring, go right ahead, Ducey says. Once plants have gone dormant, they can be cleaned up. Cut off dead flower heads to give them a tidier appearance throughout the winter, and prune your smaller trees now that you can see the plant structure. Get rid of any cross branches and suckers and consider spreading mulch around any perennials, to make sure they have a good layer of insulation as they head into the colder months. “The mulch will help mitigate the freeze and thaw cycles our plants go through during that time of year,” Ducey says. As long as the ground isn’t frozen, you can even plant certain species so that they’ll be ready come spring, Ducey says. He suggests heading to your nearby garden center to check out seasonal sales. Just make sure you choose plants that are hearty enough for a late-fall planting. If you have any newly planted evergreens, send them into winter well-saturated so that they wake up with an ample supply of water, Ducey says. And though you can trim smaller species, like apple trees, in the fall, wait until mid-winter to tackle oak trees. “You want to wait until there’s absolutely zero chance there’s a pathogen or insect that can hit the oak,” Ducey says. Don’t forget about your hardscapes. If you have any kind of water features, like fountains and pools, make sure to winterize them properly. You don’t want to have a pump freeze, crack or break, Ducey says. Finally, fall fertilizers can give plants – and your lawn – a boost for winter, and they’ll provide a bit of extra nutrition come spring, Ducey says. These slow-release fertilizers are specifically made for autumn, so consider talking with a lawn treatment service to find out which brands will work best for your yard. Then, it’s time to sit back, eat pumpkin pie and watch the colors in your yard, Ducey says. “Just enjoy your garden as much as possible; it’s the fruits of your labor all spring and summer long,” he says. This entry was posted on Tuesday, September 12th, 2017 at 12:00 pm	and is filed under Home & Garden, Top Posts. You can follow any responses to this entry through the RSS 2.0 feed. Both comments and pings are currently closed.